Favourite Animals (pictured above) kicked off the evening with Confirm or Deny which was a bit of stop-start affair until a really powerful groove kicked in to get the crowd rocking on their chairs. The rest of the set had a very cinematic feel to it. Graham South on trumpet seemed to dominate Boiling Point and on their final piece Shreds Dee Byrne on alto and Graham South on trumpet once again featured strongly. There were some very interesting combinations of instruments in this ensemble particularly the twin flute and bass clarinet pairing of Julie Kjaer and Tom Ward. The music although improvised has a far more contemporary classical feel to it than a bluesy jazz one but whatever the label everyone seemed to wholeheartedly enjoy the experience. Article XI was formed by Anton Hunter as the result of a commission from the 2014 Manchester Jazz Festival and takes its name from the said article of the European Convention of Human Rights although the reason why this name was chosen was neither explained or discussed. Another interesting line up with a vast brass section featuring 2 trombones, 2 trumpets. 2 altos, a tenor and a baritone. The music is improvised around Hunters compositions with space given to the individual soloists to explore the framework constructed. The result produced a more jazz-like feel to the proceedings than maybe the previous band had. The set got off to a flying start with 2 tracks Munichcreation and Always a Fox which are actually not on their forthcoming eponymous debut album. The scene had been well and truly set great ensemble playing spiced up with imaginative solos. It is not often you say a song does just the opposite of what it says on the tin but Not the Kind of Jazz you Like did exactly that! It was hard to single out any soloist in such a large ensemble but one of the guys I had never seen before, Simon Prince on tenor and flute, really impressed and I hope we see him again soon in some format or another. The evening closed with what appeared to be a planned encore I Dreamed I Spat Out a Bee which began with the trio, Johnny Hunter on drums, Ollie Dover on alto and Seth Bennett on double bass , before the rest of the band joined in and brought this brilliant doubleheader to a triumphant close. A marvellous evening my only regret being that we only got to see one set of each band. Given the nature of these groups, there was always so much going on that one tended to focus on selected sections of playing thereby missing out on the equally interesting parts of the others. Maybe the best thing to do is get the respective CD’s of both ensembles. That way you can make sure you don’t miss out on anything as you relisten to this fabulous music time and time again. 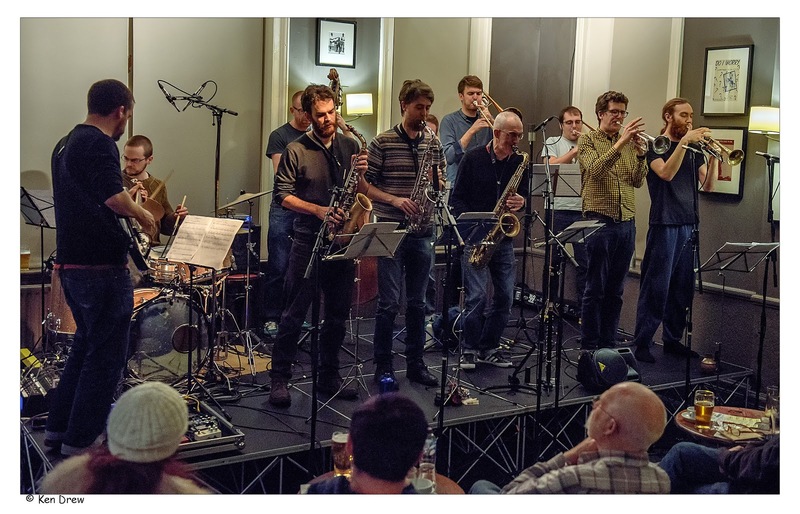 Sam Andreae (alto sax); Ollie Dover (alto sax); Simon Prince (tenor sax, flute); Cath Roberts (baritone sax); Graham South (trumpet); Nick Walters (trumpet); Tullis Rennie (trombone); Kieran McLeod (trombone); Anton Hunter (guitar); Seth Bennett (bass); Johnny Hunter (drums).